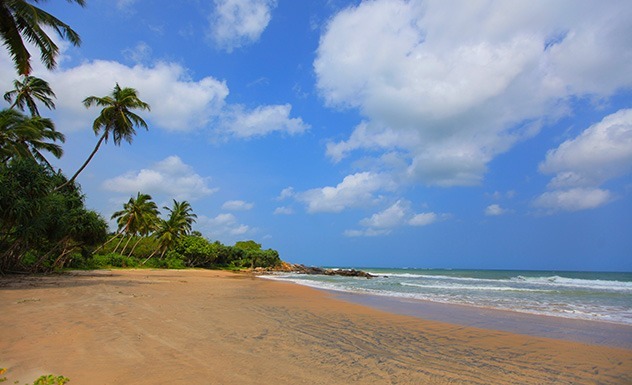 With its incredibly private location on one of Sri Lanka’s most unspoilt and picturesque beaches, this stylish villa is the perfect escape. 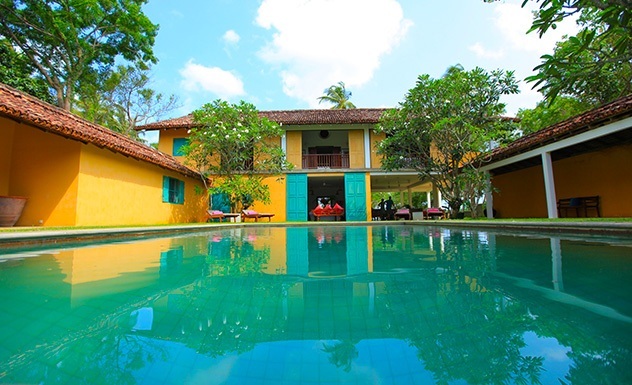 Aptly named, it is the architectural swan song of eminent Sri Lankan architect Geoffrey Bawa. 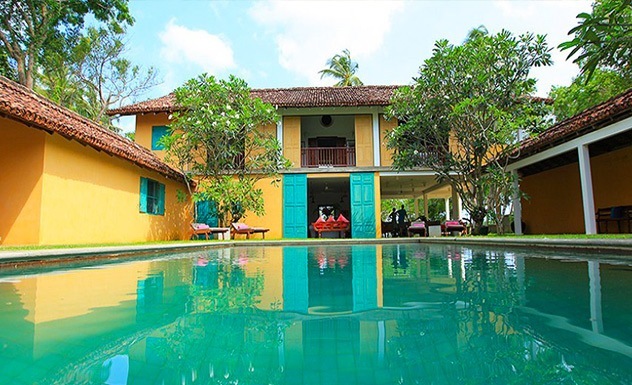 The villa consists of five beautiful bedrooms that overlook the glittering Indian Ocean or the small adjoining lagoon visited by exotic birds such as kingfishers and herons. The layout of the villa is shaped like a horseshoe and divided into a number of wings with kitchen, living rooms and courtyard bedrooms on either side of an inviting emerald green swimming pool designed to offer privacy to groups of friends and generations of families. The interior of this villa is striking; whitewashed walls contrast with distressed blue window and door frames that give it even more of a ‘beach house’ appeal. Bright cushions, vivid bedspreads and temple wall hangings enhance the cream-washed arches while large glass and teak tables are placed atop rush mats. 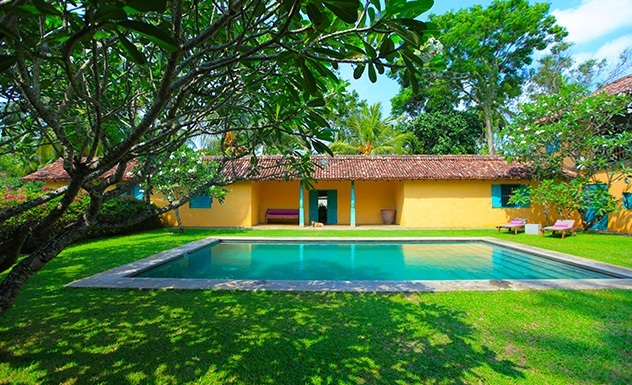 Bawa’s influence is reflected in the cool cement floors and pillared verandahs that frame intriguing views of the sea. The in-house staff of five will pamper you with ease and provide for any need you may have. The cuisine is particularly fresh and delicious. The swimming pool is privately situated to the back of the house while the elegant two-acre gardens have grassy ‘child-friendly’ lawns. A little gate opens from the garden onto the long, beautiful stretch of sandy beach which is enhanced by coral pools that offer safe swimming year-round. As the villa is so magically secluded and spacious it is ideal for family gatherings and friendly reunions. This enormous room is located on the first floor of the main house. Characterised by ceilings open to the rafters, large temple doors reveal a sea-view balcony shared with the suite next door. The interior is furnished with a king-sized four-poster bed, teak and rattan lounge chairs, antique wardrobes, a writing desk and a luxurious en-suite bathroom enhanced by a sea-view claw-footed bathtub. Located next to the Master Suite and sharing the same spacious sea-view balcony, the Family Suite comprises a tastefully decorated twin bedroom with baby cot and a small adjoining nanny room. The en-suite bathroom shared by both rooms has both a bathtub and a shower. These two rooms are especially charming and feature semi-open air bathrooms adorned with leafy plants. The room in the East Wing is characterised by the stylish decoration of a beautiful turquoise butterfly that hangs over the antique king-sized bed and a bathroom with open-air sunken bathtub. Across the courtyard, the second bedroom overlooks the lake and has a similarly atmospheric bathroom open to the sky. 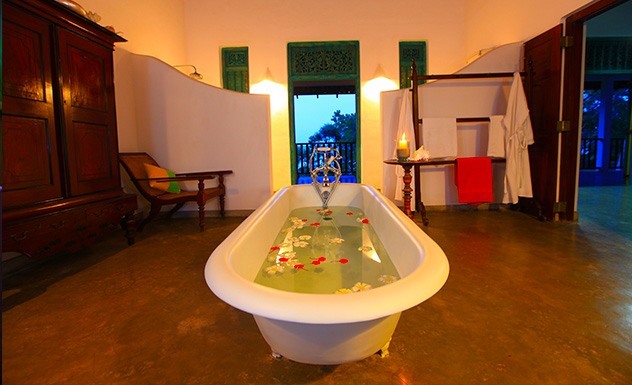 This romantic room is elevated on jackwood stilts to the front of the villa. It has views over the lagoon and is characterised by three walls of glass-shuttered windows that make the room extremely light. Soft muslin drapes frame the windows and provide privacy to the king-sized bed while the little en-suite bathroom features a modern tiled shower room. The experienced chef is on hand to tickle your taste buds at any time of your choosing. With local fishermen often bringing fresh fish, crab and lobster to the back door of the villa the emphasis is definitely on seafood although the chef will discuss your meal requirements with you daily and shop for whatever ingredients you may need from the local markets of Tangalle. A second kitchen in the villa allows guests to cook their own meals if they prefer or perhaps prepare food for babies and children. Meals may be served to any location of your choosing; so enjoy lazy breakfasts in the garden and lunches featuring rice and curry, spicy pumpkin soup, lobster and mango salad, prawn satay or a selection of pastas from the terrace. 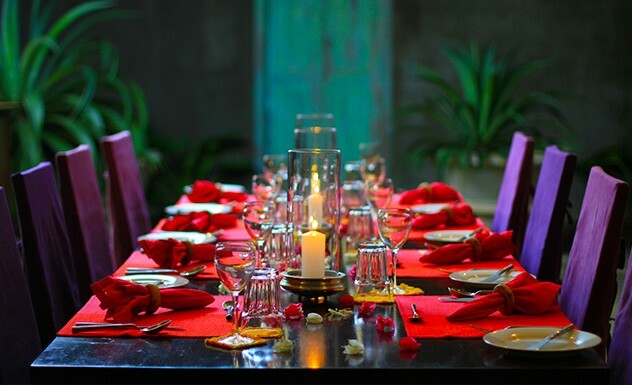 Candlelit three-course dinners are memorable and are accompanied by house wines and concluded with a traditional Wattalapan or passion fruit brulée. All food and drink, including afternoon tea, soft drinks and alcohol, is thoughtfully sold at a cost price per person per day. It is advisable to inform the villa staff of your alcoholic preferences in advance of your arrival. A great place for families with a large garden and pool. Children can have fun swimming and body-boarding in the sea and there are many day trips to take, including a visit to the Turtle Conservation Centre in Rekawa.